Otterbein University Theatre apparently is giving Fiddler on the Roof to John Stefano as a going-away present. The professor, who’s retiring after 24 years in the theater and dance department, had long dreamed of playing the iconic dairyman, Tevye. It’s a wonderful gesture on Otterbein’s part, but it wouldn’t have been surprising if the result had been a production that fell far short of the Tony-winning musical’s potential. After all, you can’t build a show this massive around a single actor. Thankfully, Otterbein’s theater program is sufficiently rich in talent that its production has several stirring moments. One of them comes shortly after Tevye introduces us to his Russian hometown, a Jewish community that, in the pre-revolutionary political climate of 1905, is finding life increasingly precarious. Gathering together with their families for the Friday night meal, Tevye and other villagers sing the beautiful Sabbath Prayer. It’s a heartfelt scene that underscores the message of Tradition, the anthem that opens the show: These humble folks cling to their beliefs and rituals to give meaning to lives mired in poverty, pain and struggle. Also stirring is the wedding scene in which Tevye and wife Golde (Aubree Talley) marry off the first of their five daughters. Its highlight comes when four dancers perform difficult moves while carefully balancing bottles on their flat-topped hats. Bravo! In general, director Lenny Leibowitz’s production is at its best in large numbers involving singing and dancing. 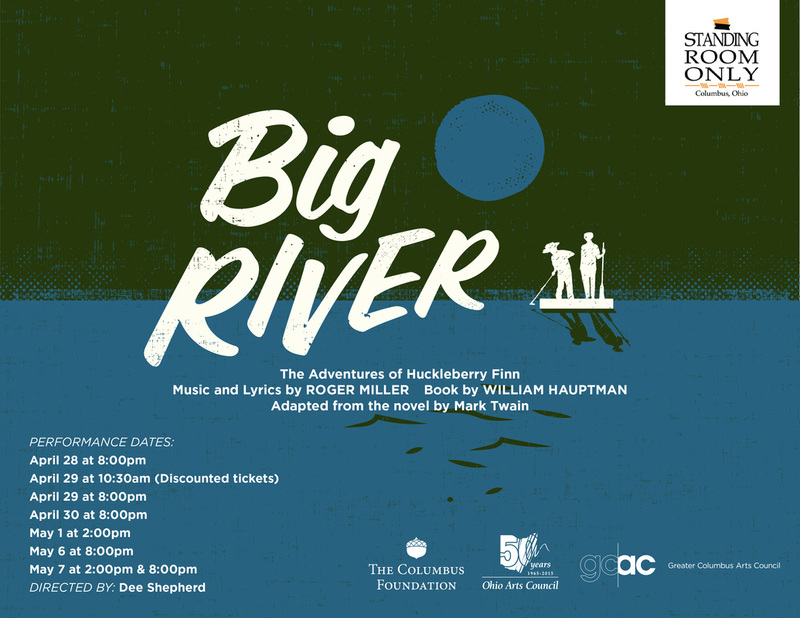 Otterbein has enough fine vocalists and dancers to carry off Jerry Bock and Sheldon Harnick’s glorious anthems and Stella Hiatt Kane’s acrobatic choreography, and rousing accompaniment is supplied by the ample-sized orchestra performing under Lori Kay Harvey’s baton. Many of the individual actors also sing beautifully, including Lauren Kent, Natalie Szczerba and Abigail Isom as Tevye’s daughters Tzeitel, Hodel and Chava. Their early trio, Matchmaker, is an engaging exploration of their mixed feelings toward the ancient tradition of arranged marriage. As for Stefano, he’s not the strongest vocalist who ever hauled around Tevye’s milk cart, but neither is he the weakest. Yes, his voice sometimes falters, but it does so in a way that makes the character all the more endearing. Stefano also shines during the humorous moments in which Tevye complains to God about his sad lot in life—or to the audience about his loving but fear-inducing wife, Golde. The actor’s comic timing is spot-on. It’s in the more dramatic moments that the Otterbein production sometimes lacks finesse and timing. One example is the aforementioned wedding scene, which peters out long before it’s interrupted by an attack that foreshadows new problems for the local Jewish community. Another example: Connor Cook is appealing as Motel, the shy tailor who’s afraid to ask Tevye for the hand of his oldest daughter, but the moment in which he finally works up the nerve is rushed through before it has a chance to sink in. Other problems can be traced to overacting (Dana Cullinane as the over-the-top Matchmaker) or underacting (Andre Spathelf-Sanders, who barely registers as Chava’s non-Jewish suitor). And though Tally strikes the right balance between scariness and warmth as Golde, neither she nor her makeup artist make a serious attempt to disguise the age difference between her and the actor who plays her husband. As a result, it’s hard to believe Golde and Tevye’s marriage really has endured for 25 years. The production has many strengths beyond those I’ve already mentioned. They include supporting players Connor Allston as Perchik, the radical student who woos Hodel, and Jack Labrecque as Lazar Wolf, the lonely butcher who sets his sights on Tzeitel. Rob Johnson’s nonrealistic scenery and T.J. Gerckens’s lighting also are striking. Overall, though, this staging of the musical tragicomedy is more effective as a musical and a comedy than it is as a tragedy. 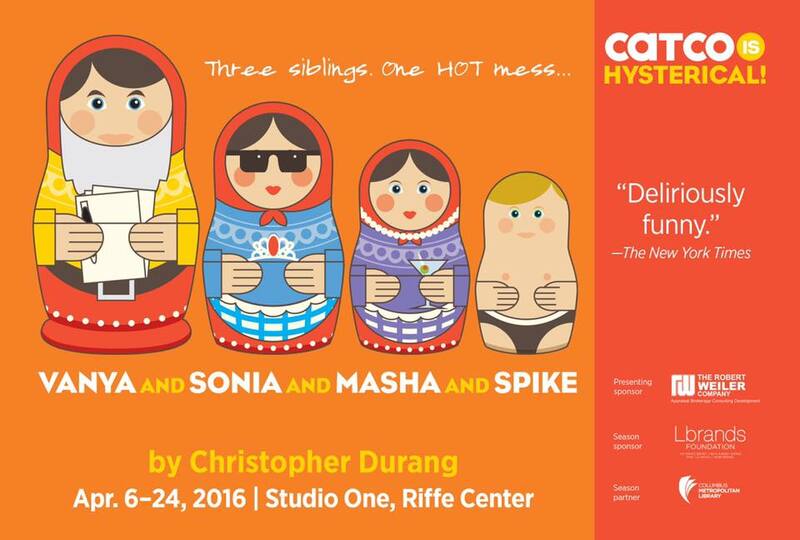 Most productions of Fiddler on the Roof are three-hankie affairs, but one should be enough this time around. 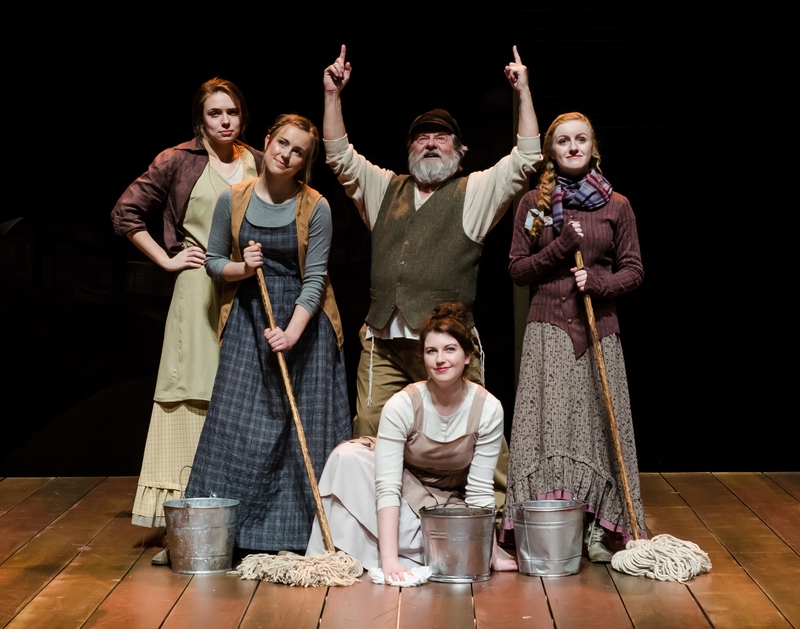 Otterbein University Theatre will present Fiddler on the Roof through April 16 at Cowan Hall, 30 S. Grove St., Westerville. Show times are 8 p.m. Thursday-Saturday. Running time: 2 hours, 55 minutes (including intermission). Tickets are $25. 614-823-1109 or www.otterbein.edu/drama. Why is Jersey Boys so much more fun the second time around? Part of it may be due to lowered expectations. Prior to the touring show’s Columbus debut in 2011, the press attended a preview during which we were told to expect a spectacle that would put every other musical to shame. We also were informed that male viewers, in particular, would be reduced to manly tears by this trip down the Four Seasons’ Memory Lane. Well, it didn’t happen. Not to me, at least. The show’s historically correct harmonizing was great, but the dramatic portions left my eyes dry. Fast forward to earlier this week, when the latest version of the touring show returned to the Ohio Theatre. I went, expecting little, and got a lot. In fact, I had a ball. But the difference can’t be attributed entirely to my new lack of optimism. I think the production is noticeably better this time around. That’s particularly true in regards to the key role of lead singer Frankie Valli. Two years ago, the featured actor hit the falsetto notes with aplomb, but he couldn’t carry off some of the tale’s most touching moments. Now, though, Nick Cosgrove does it all without a hitch—singing, acting and even a few athletic dance moves. 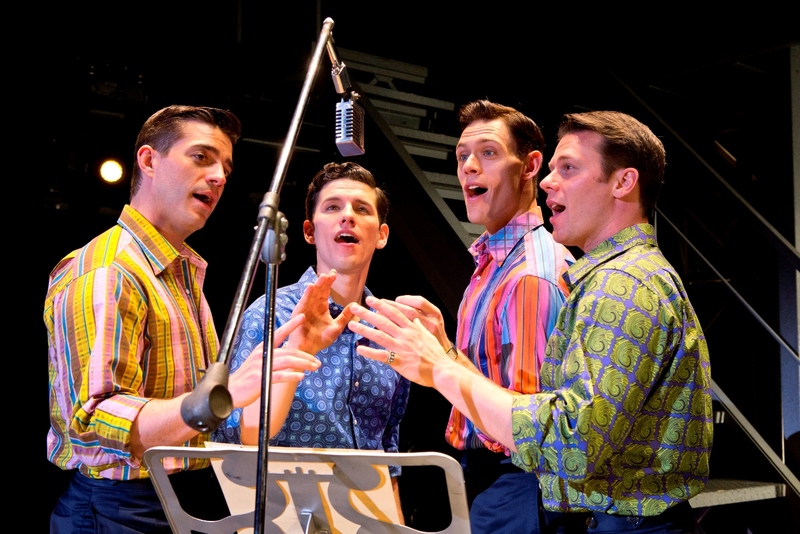 Actors playing the rest of the New Jersey-bred quartet are equally fine: Nicolas Dromard as the out-for-himself Tommy DeVito, Jason Kappus as songwriter Bob Gaudio and a comically laconic Brandon Andrus as Nick Massi. With a book by Marshall Brickman and Rick Elice, this 2006 Tony Award winner relates the history of the Four Seasons by allowing each member of the 1960s rock group to tell his side of the tale in turn. It’s a clever tack and probably a necessary one, given that three of the four original members are still alive and don’t necessarily agree on the details. A bevy of talented supporting cast members play the many people who wander in and out of the musicians’ lives. Key actors include Barry Anderson as record producer Bob Crewe, Marlana Dunn as Mary Delgado and Thomas Fiscella as sentimental gangster Gyp DeCarlo. Under Des McAnuff’s direction, the cast and crew work as a unit while the action flows fluidly from one scene to the next, sometimes even in the midst of song. 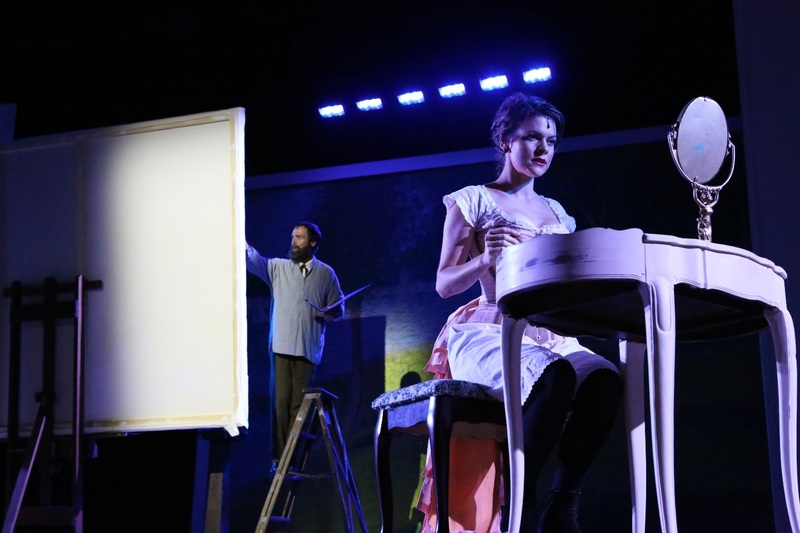 Meanwhile, Klara Zieglerova’s set design and Howell Binkley’s lighting design fill the stage with images that are subtly handsome and perfectly complementary. As a piece of stagecraft, Jersey Boys is a wonder. But the show’s real highlight is the music—the just-right re-creations of hits such as Big Girls Don’t Cry, Walk Like a Man and Can’t Take My Eyes Off You. And that’s due not only to the actors’ vocal prowess but to conductor Ben Hartman and his onstage band. Special kudos to Mark Papazian, without whose emphatic drumming the night would be far less joyful. Were my eyes still dry when I left the show this time around? Yes, but I didn’t care. The rest of my face was smiling. Broadway in Columbus and CAPA will present Jersey Boys through Sept. 29 at the Ohio Theatre, 39 E. State St. Show times are 7:30 p.m. Tuesday-Thursday, 8 p.m. Friday, 2 and 8 p.m. Saturday and 1 and 6:30 p.m. Sunday. Running time: 2 hours, 35 minutes (including intermission). Tickets are $28-$128. 614-469-0939, 1-800-745-3000 or ticketmaster.com.